Ever wondered how Santa Clarita’s mailing house got started? Learn how Mellady Direct Marketing turned a garage office into a full-scale marketing firm — and put its own stamp on the American Dream. When Jim and Jill Mellady dropped their first order of newsletters in the mail, they had no idea what they would eventually receive in return. Jim was an engineer who could fix almost anything, and Jill was a secretary with ambition and a knack for sales. Together, they learned the mailing world and built Santa Clarita’s mailing house, a business that could endure the toughest times and keep up in the best times. Their family-owned mailing house may have started as a quietly ambitious side job, but it quickly became a multi-faceted business no one could ignore. Today, Mellady Direct Marketing reaches every single home in Santa Clarita — and it all started in a garage. Jim and young Stephanie Mellady sit on the couch while mailing. In 1986, Jim and Jill were working at Lockheed-Martin Skunk Works in Palmdale, where they had met, eloped and started building a life together. A family member knew the Society for Automotive Engineers was looking for someone to produce and mail a newsletter to its members. Each month, Jill would hop on her IBM PC, and Jim would cut out the articles, aligning them with precision on his drafting board. Then, together, they’d sit on the couch while they watched TV, stamping and labeling by hand. “It was just a way to make a little extra money on the side,” Jill said. 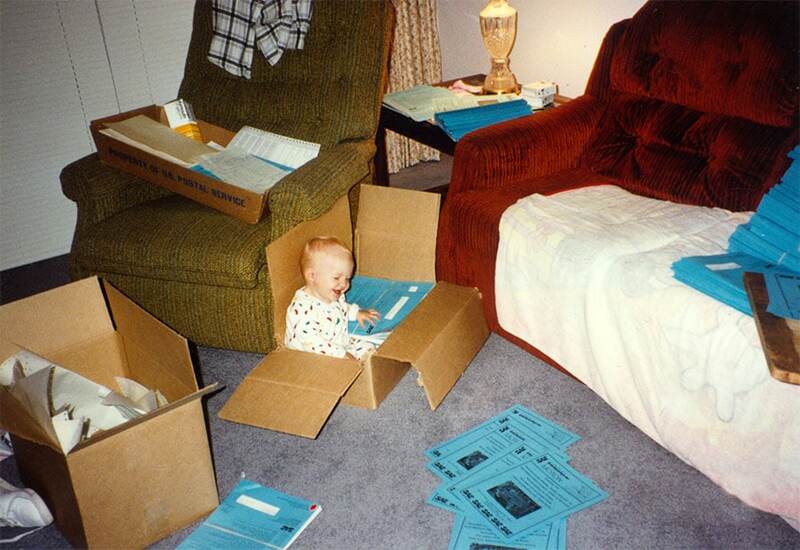 Young Stephanie Mellady learns the ropes of the mailing industry. In 1990, Jill became pregnant with her daughter, Stephanie, and left Lockheed. While she loved being a new mom, she quickly grew bored without work — and Jill got back to mailing. She turned the garage into an office, back when no one worked from home, and started attending the local Women in Business networking group, with Stephanie on her hip. Through networking, she was able to get more business, and soon Jill and young Stephanie were on their way to client meetings. Mellady Direct Marketing was in full swing, and it was time for growth and automation. When Jim was made aware of a new discount through the post office, he recognized the need for a special label printing machine that would qualify their business for a cheaper postage rate. Not only did the machine increase their speed but also their bottom-line — and additional equipment investments steadily followed. Meanwhile, Jill had partnered with another former Lockheed mom for graphic design services. With Jill running sales, new accounts kept coming, including Henry Mayo Newhall Hospital, U.S. Borax and more. At night, they would get the kids ready for bed, and then Jim started running the machines. Together, they would get everything ready to be mailed and load up the car. 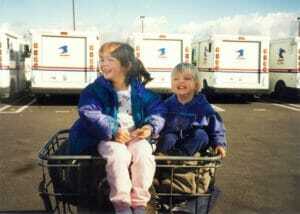 The next morning, Jill would drop off the kids at preschool and deliver everything to the Post Office. “I met so many great people there,” Jill said fondly. With the purchase of the first official Mellady Direct building on Reuther Avenue, they started taking on larger fulfillment jobs, such as Maxim’s Hot 100 and stamps.com. That day, Jim gave his notice at Lockheed. Brendan Mellady (on the right) creating a little havoc at the post office. And so Santa Clarita’s mailing house began hiring and expanding. 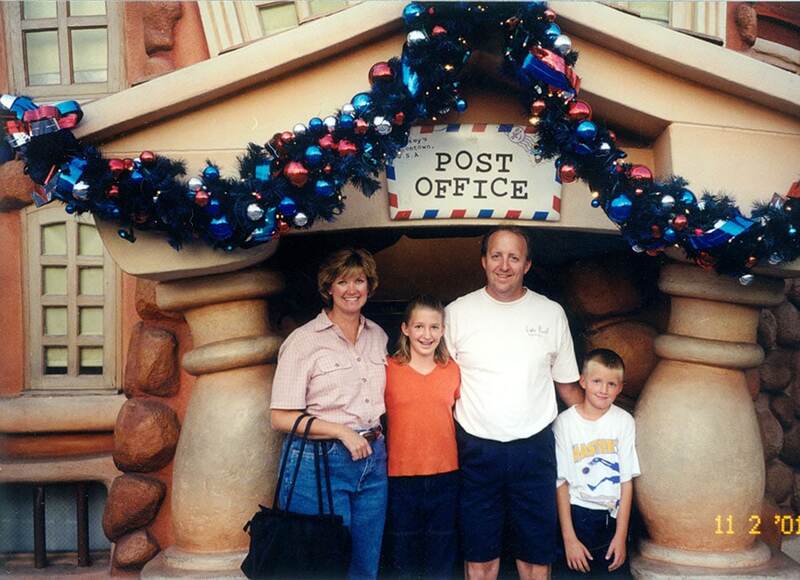 Jim and Jill worked 7 days a week for years, bringing Stephanie and their son, Brendan, to the office. As Brendan shot rubber bands at employees, Stephanie would make fun of her mom’s giant cell phone, which was always ringing. Jill was running sales, giving Jim the opportunity to focus on expansion and the future. Together, the family was building their American Dream from the ground up. As Stephanie and Brendan got older, they continued to be heavily involved in the business, learning what they could and sharing in their parents’ passion until, eventually, the whole family was punching in. In 2017, Brendan joined Mellady Direct Marketing as Operations Manager, and Stephanie came on board as Director of Business Development in 2015. They even moved into a brand-new building in 2015, tripling their space and calling Avenue Stanford their new home. Today, Mellady Direct Marketing has diversified significantly, adding digital marketing services to their repertoire. After all, Mellady Direct Marketing started as a humble mission to help businesses get their message into the homes of their community. As that simple goal becomes more and more complex in a digital world, the Melladys are putting their own stamp on marketing with the same dedication and adaptability that started their business. There aren’t many businesses today that can claim they have given their clients over 32 years of professional service. Mellady Direct Marketing can. Our direct marketing company has grown to a nationwide digital and print marketing company, meeting the direct mail marketing needs of the Santa Clarita Valley and beyond. A lot has changed for Santa Clarita’s mailing house in the past 32 years, but one thing we know for sure: We love what we do, and we continue to think about the future of our company, make our processes more efficient, and save our customers money. At Mellady Direct Marketing, your business is our business. Learn more about Santa Clarita’s mailing house here. I loved this article and the history behind your company! Now this needs to be published in a magazine, newspaper, business networking groups and all media outlets to inspire like minded entrepreneur’s of how a real home-based business is built from the ground up. Home-based businesses are real, and if managed properly with the necessary skills and passion, can turn into a life changing experience. Every time I hear how it all started, it motivates and inspires me to continue to move forward through life, with hard work and passion that has always been instilled in me. In the 1990’s, I was fortunate with the opportunity to have met The Mellady family, as a client delivering a multitude of postcards, letters and envelopes to be mailed for the Real Estate Industry from their Home Office, “The Garage”, and extracting huge amounts of data for direct mail processing for our client’s to receive discounts in postage. Jill and Jim had the passion back then, as they do today, to thrive and accomplish the best possible marketing/business strategies for their clients to meet their budgets and save marketing $$$’s for each and every campaign that is mailed. 32 years in business is a huge accomplishment while surviving during one of the greatest recessions we have experienced in the 20th Century. Very well written and a book should be published, lol. Congrats Mellady Family on a great American Blue Collar Story and showing everyone, the American Dream can be accomplished with hard work, dedication and most important PASSION. It’s been an honor to have been apart of your American Story!! !